Priests in the Diocese of Rockhampton are sharing the joy of Christ’s birth, providing hope for communities devastated by prolonged drought and catastrophic bushfires. Fr Matthias Ogwo, Fr Raj Kodavatikanti HGN and Fr Ronaldo Rodriguez have already begun celebrating Christmas Masses and will collectively clock up several thousand kilometres driving between isolated mining towns and farming communities. Rockhampton Bishop Michael McCarthy, who is visiting the Holy Land, has spoken about how in his four and a half years as bishop, the diocese had experienced cyclones, floods, a long and severe drought, an earthquake, a locust plague and, last month, catastrophic fires. He said it was after Cyclone Debbie that he first became aware of the real suffering of people who had lost homes, property, livestock and crops. The story repeated itself in the catastrophic fires with sugarcane fields burnt out and properties razed. 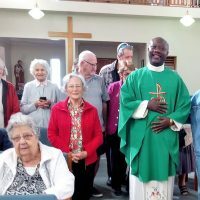 In the central west of the diocese, parishioners are still praying for more rain after a blessing of 30mm last week, according to Fr Ogwo, Longreach relief priest. Fr Ogwo said his location involved much driving among the cluster parish churches, sometimes up to 200km between towns. “But I find joy in doing that when I know that I am going to celebrate Mass. I am going to meet people out there to talk about Jesus and bring relief and reassurance,” he said. “It’s very good to bring the joy of the Gospel to the people of Alpha, Aramac, Barcaldine, Blackall, Ilfracombe, Isisford, Jericho, Jundah, Longreach, Tambo and Morella. With summer temperatures in the 40s, Fr Ogwo said he was adapting to the change in culture and surrounds after having arrived in the diocese in May this year from his home country of Nigeria. “We had some heavy rain last week and many people saw this as a Christmas blessing from God. We are still praying for more rain out here,” he said. Emerald parish priest Fr Kodavatikanti and Fr Rodriguez, from Clermont, will also be putting the pedal to the metal as they drive between communities to celebrate Mass in geographically dispersed parishes. Fr Kodavatikanti, who is from Andhra Pradesh in Southern India and has been in the Rockhampton Diocese for four years, will celebrate Mass in Emerald and also travel to Springsure, Rolleston and Anakie. “Lots of people come to the midnight Mass in Emerald, even from faraway places and properties. This will be my first Christmas in this parish and I’m really looking forward to this,” he said. “Springsure community, along with the schools, held their own Carols by Candlelight services at the Town Hall. The town’s children performed the Christmas carols and songs fantastically. Fr Kodavatikanti said one of the highlights of the build-up to Christmas was the Walk to Bethlehem, an ecumenical program where children and parishioners dressed up to re-enact the story of the birth of Jesus. In Clermont, Fr Rodriguez will celebrate his last Christmas Masses in the Peak Downs Catholic cluster of parishes before his move to Bundaberg. “I am currently covering four parishes which comprises six churches,” he said. Fr Rodriguez said he had averaged 300km to 500km for Masses every weekend since he began at Clermont three years ago. Fr Rodriguez will celebrate Christmas Masses in Moranbah, Clermont and Capella – communities that have also suffered from the prolonged drought and a mining downturn. He said while he was looking forward to his “sea change” to Bundaberg, he had found country people to be very hospitable, friendly and welcoming. Until his move in the new year, he will still have time to add a few more hundred kilometres to the mileage as he continues to deliver the Gospel message.